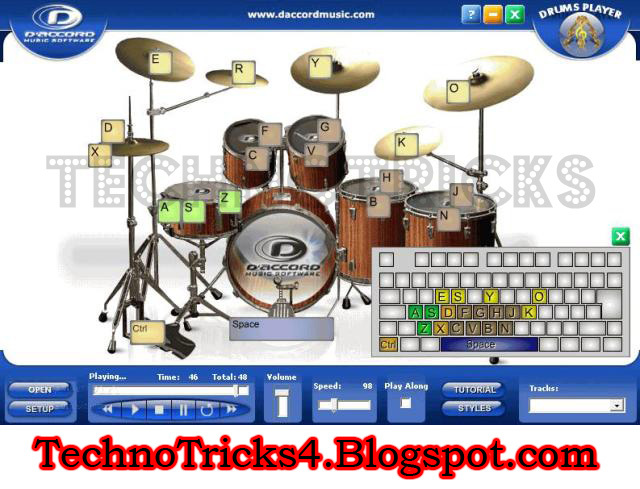 D'Accord Drums Player lets you practice and learn how to play the drums! This application can open and play any MIDI file (.mid), and show you how to play the song on a virtual drum kit. Created for beginners, the software is a tool for drummers to practice their favorite songs by trying to follow it as the software plays it. 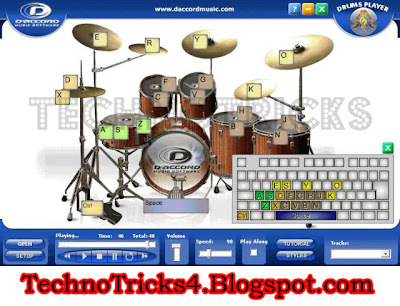 It's also possible to play the drums with the software, using a keyboard. There is a key mapping function that makes it easy to play, so that the user can have fun with the virtual drums. The Play Along feature mutes the drum sounds, keeping the other instruments sounds playing, so that the student can play along with it. It also has some examples of different rhythms like rock, pop, ballad, and samba; the user can learn how to play them. Speed Control: Play the music slower or faster, making it easy to learn! Play Along: Enables you to mute the drum sounds, so you can play along. Create and play any rhythm on the virtual drums with Keyboard mapping. Plays any MIDI (.mid) file. Popular format available on many internet sites! Control which instruments you want to hear by selecting the midi channels. "well-designed virtual drum set makes a fun and nifty download" ... "elegant interface gives you a behind-the-kit view of a five-piece drum set" ... "eats very little system memory"